Our marketing efforts have been very successful. What began as a World Golf Village, King and Bear and Palencia home inspection company has quickly grown to include all of Jacksonville, St Augustine, and even Palm Coast. Whereas our initial focus area included mostly newer homes, many of our inspections now are in more established neighborhoods and are of older homes. Older homes present different challenges: crawlspaces, copper pipes and original electrical wiring. 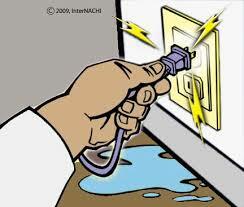 Most of this older wiring does not include ground fault circuit interrupter (GFCI) protection. Newer code does not apply to these homes. Unless they were built or renovated after the code took effect, they are grandfathered in. An analogy that I use often during presentations, that I borrowed from a very respected Jacksonville home inspector and radio host, is if you have your heart set on buying a 1965 Chevrolet Corvette, you’ll have to accept that it doesn’t come with air bags. And if you’re buying a 1965 bungalow by the beach, you may have to accept that it doesn’t come with GFCI. What exactly does GFCI do? The electricity in your home runs in circuits. Along the various circuits the electrical current should be equal at all points. 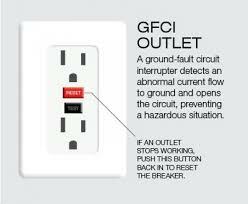 The GFCI device can be a breaker in your service panel or it can be an outlet upstream of the outlets that it is meant to monitor. It constantly measures the amount of electricity going out and coming back along the circuit. If it senses that the amount of electricity coming back is less than what went out it immediately shuts down the circuit. This happens when current has begun to flow through an unintended path, such as water or a human body. If the current is flowing through a body there is a real risk of shock, electrocution, and in some cases death. So what does the responsible home inspector do? The Florida standard of practice (SOP) for home inspectors instructs us to report on items that are “significantly deficient or at the end of their service lives”. In the electrical section of the SOP it specifically mentions inspecting GFCI. But what if it’s not there? Can you inspect it then? Of course not. Is the absence of GFCI in an older home an issue that should be included in the inspection report? Maybe; there are differing opinions among home inspectors on this and I understand the argument of both sides; more on that in a moment. Home inspectors are fond of saying that they aren’t code inspectors and I agree with that. Code is just a minimum requirement for safe building practices. Most home inspectors inspect to a higher standard and the safety of their customers is a primary concern. Some take this to extremes and point out a crack in the driveway or a sunken living room as a trip hazard but most are intelligent enough to leave these things out of their reports. The lack of GFCI, I think, is a different issue. GFCI protection can save your life and it is very inexpensive and easy to install even to the oldest of homes.